The Dynamic Duo Stinky Cake is for the new bundle of joy. This Stinky Cake is loaded with goodies that Mom can use on Mr. Young Entrepreneur or The New Diva. 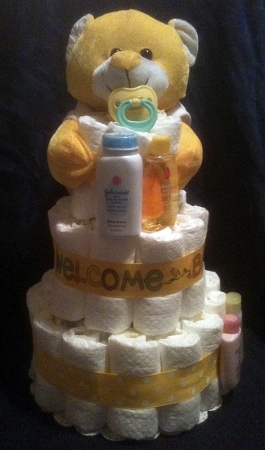 This Stinky Cake is decorated with high quality yellow or purple ribbon, and also comes with a matching teddy bear for the future bundle of boy, or daddy’s little girl.